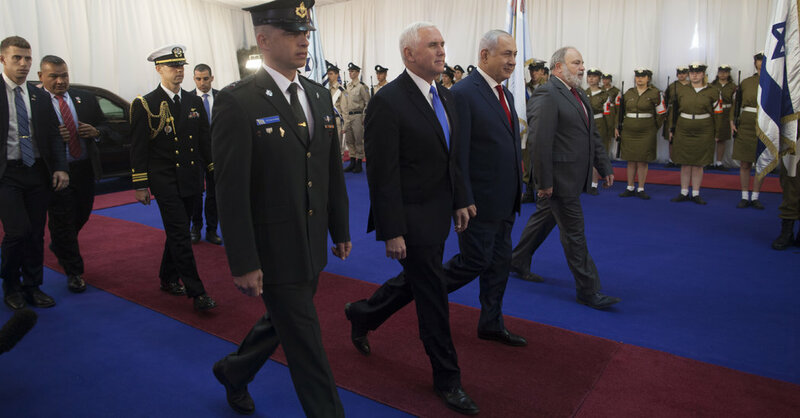 BEIRUT, Lebanon — Vice President Mike Pence said on Monday that a new United States Embassy to Israel would open in Jerusalem before the end of 2019. Mr. Pence’s statement, made to the Israeli Parliament during a trip to the Holy Land, follows President Trump’s recognition of Jerusalem as Israel’s capital last month, a move that overturned decades of American policy and international consensus on the status of the holy city. Palestinians claim Jerusalem as their capital or believe it should be divided, with East Jerusalem becoming the capital of a Palestinian state. The international consensus, previously supported by the United States, has been that the city’s status can be determined only through negotiations between the Israelis and the Palestinians. Mr. Trump has said that the embassy’s move to Jerusalem from Tel Aviv should not hamper peace talks. He says he is working on a “deal of the century” that will resolve the conflict, although few details have been released. Mr. Trump has also threatened to shutter an office of the Palestine Liberation Organization in Washington, and cut American donations to the United Nations agency that provides services for Palestinian refugees. That approach has been welcomed by many Israelis, while rankling with Palestinians, whose political and religious leaders have refused to meet Mr. Pence. “This is the first time that I stand here where both leaders can say those three words: ‘Israel’s capital Jerusalem,’ ” Mr. Netanyahu said during a meeting with Mr. Pence. In a statement on her Facebook page, Israel’s culture minister, Miri Regev, called Mr. Pence “a very welcome guest here” and thanked him and Mr. Trump for endorsing the Israeli claim to Jerusalem and for cutting funding for the United Nations agency. “Truth must be said and the truth is that Israel and Jerusalem belong to the Jewish people,” Ms. Regev wrote. Mr. Pence is an evangelical Christian who has spoken of protecting Christian minorities in the Middle East but who been widely shunned by those same Christians for his embrace of the Israeli position on Jerusalem. No Arab Christian leaders have agreed to meet with him during his visit, and he is not scheduled to visit Christian holy sites like the city of Nazareth, the West Bank town of Bethlehem or the Church of the Holy Sepulcher, where tradition holds that Jesus was crucified. Mr. Pence canceled his last planned trip to the Holy Land before Christmas after Christian Arab leaders declined to meet with him.